Pair Dyron’s Winter Mix Grill with Satsuma Old Fashioned. Ward Halliday is a new face at Dyron’s Lowcountry, as bartender and front of the house manager. But he is a familiar face to many from his nights behind the bar at all of Frank Stitt’s restaurants. 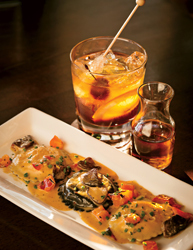 Pair New Old Fashioned with Lobster Ravioli at Seasons 52. I always look forward to getting a taste of Seasons 52 Fresh Grill’s new menus. They change with each season. And on the Winter 2015 menu I found a divine new pairing, which comforts and warms this rainy day—New Old Fashioned and Lobster Stuffed Black and White Ravioli. Both the cocktail and the ravioli are highly recommended separately. And together, their flavor profiles are quite the match, as Managing Partner Michael Gambino suggested they would be. The Hastings’ Hot and Hot celebrates 20th Anniversary. Chef Chris and his wife, Idie Hastings opened Hot and Hot Fish Club in November 1995. During the two decades that followed, the Hastings developed and maintained strong relationships with local purveyors, foragers, artisans, farmers, and fishermen who supply food to this farm to table restaurant. These local, seasonal, and Southern products are featured in dishes inspired by all cultures from across the globe. Through the years Hot and Hot has also cultivated an ever-growing foodie following, of locals who dine here regularly, and the well deserved reputation of being among the best restaurants in Birmingham and the South. Chris Hastings is the keeper of a new flame at OvenBird. Chris and Idie Hastings open their second restaurant, OvenBird at 2810 3rd Avenue South, at Pepper Place. Ovenbird is a refined yet rustic restaurant that offers a well conceived and beautifully executed indoor–outdoor dining experience of small plate fare cooked over a live coal fire. It is named for rfuous hornero, “red ovenbird,” a South American bird that builds its oven-shaped nest with a side entrance shaped like an “O.” Coincidentally, OvenBird has another namesake in a poem by Robert Frost, “Oven Bird.” And the poem’s passing of time theme also befits the restaurant. Ovenbird has been in development for two years. Twenty years have passed since the Hastings opened their first restaurant, Hot and Hot Fish Club. And a live fire restaurant has been Hastings’ dream since he was a boy, cooking over campfires. Decades of experience poised Bamboo on 2nd for overnight success. Bamboo on 2nd is a new, wildly popular Asian fusion and sushi restaurant located at 2212 2nd Avenue North. Given bamboos are among the world’s fastest growing plants, the restaurant is aptly named. Bamboo on 2nd opened in July, and immediately grew to maximum capacity nightly. Seating 70, with no reservations taken, the restaurant is almost full when we arrive at 5:30 p.m. on a weeknight. So it is advised to arrive early or expect to wait, and they cannot accommodate large groups. George Reis opens 5 Point Public House and Oyster Bar. 5 Point Public House Oyster Bar is a casual, beer centric, chef driven menu, oyster house. It boasts a raw bar of fresh, Gulf Coast and Chesapeake Bay area oysters alongside local pub fare and a wide selection of craft beers, including local brews and keg-style wines on tap. Linger over a Mediterranean dinner on Vino’s pristine patio. Birmingham boasts some lovely restaurant patios. But none are quite like Vino’s. This open air space has no hedges, fences, or walls. It is a white scape of space with white pebbles underfoot and small white lights in the tree branches above its candlelit tables. Tonight Kevin and I are meeting friends for dinner with no plans to do a review. But after dinner I knew that this special dining experience had to be shared. Flip Burger’s drinks are white hot delicious. I can’t eat at Flip Burger without ordering a cocktail—or two. And today we are here to do a cocktail review. So who’s counting? Pair Ahi Tuna Tartare with Gewurztraminer at Seasons 52. We frequent Seasons 52 Fresh Grill for lunch and often make a meal of shared flatbreads and appetizers with cocktails and wine. Located at The Summit Lifestyle Center, Seasons 52 changes their menu weekly to keep up with the seasons. 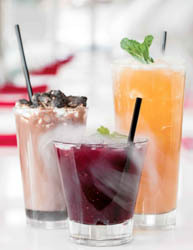 Options include organic foods and cocktails as well as gluten free, vegan and vegetarian menus. And nothing on their menu is more than 475 calories. Both locals and out-of-towners enjoy dinner at Brock’s. Brock’s Restaurant is located inside Renaissance Ross Bridge Resort and Spa, downstairs from the main lobby. It is open for breakfast daily and fine dining for dinner nightly. Drawing a loyal, local following of both nearby residents of Ross Bridge and beyond throughout the Birmingham metro area, all gather here. And resort guests do not have to leave the building to dine here. Bottega is a national landmark and a local favorite. Bottega Restaurant has been a Birmingham favorite for 27 years. The restaurant is the fine dining side of Bottega, situated on the right hand side, of the historic Bottega Favorita building. Its owners, Frank and Pardis Stitt, refer it to as “The Dining Room”. But we diehard patrons call it, “Big Bottega,” distinguishing it from what we call, “Baby Bottega,” Bottega Café, the Stitt’s casually upscale, Italian influenced eatery on the opposite side of the building. Vino’s Wild Salmon Farfella is healthy and flavorful. Vino is one of my favorite restaurants. It is also a neighborhood favorite in Mountain Brook’s English Village. But this well kept, tasty secret is getting out and bringing more and more patrons from outside the neighborhood. Get a taste of Galley and Garden. Galley and Garden opens in the redesigned Veranda on Highland building, at 2220 Highland Avenue South. Boyce Restaurant Concepts’ chef James Boyce along with his wife and partner, Suzan are co-owners with Ed Hardin. Boyce’s Southern influenced, modern Cali-French inspired cuisine is served Monday through Saturday for dinner, and for Sunday brunch. Two of Frank Stitt’s restaurants now offer late night specials. Both Bottega Café and Chez Fonfon now have late night specials from 9:00 until 10:00 p.m. on Tuesdays through Saturdays. And we recently caught both of them on two separate weekends. Sancerre is lovely match for Bistro 218’s red snapper. The Alabama red snapper season is one to catch. We did just that and paired this beautiful fish with a bottle of Domaine Vincent Delaporte Sancerre 2012. Iron City Grill mixes music with local food products. Iron City Birmingham will entertain you and sustain you. It boasts a large entertainment venue, bars, and a full service grill. There are two entrances. The main entertainment entrance is 513 22nd Street South—landmarked by its massive marquee. And the entrance to the Grill is located at 2208 6th Avenue South. Iron City Grill serves lunch and dinner Mondays through Fridays, dinner on Saturdays, and is open only on concert Sundays at 4:00 p.m. Iron City Grill also has live music on Thursday through Saturday evenings and on Friday during lunch. Chez Fonfon calls me for lunch, dinner and late night. Chez Fonfon is more than a bustling, French bistro to me. Having a love affair with all things French, it is my familiar way of escaping to the country that I most love to visit without ever leaving town. Chez Fonfon’s French Provencal food, French wines, and French ambience embrace me, and I them. Hot and Hot Fish Club reinvents the Noodle Bowl. Chef Chris Hastings is constantly innovating the cuisine at Hot and Hot Fish Club. And one of his most famous, cutting edge, culinary inventions is his version of the noodle bowl—Hot and Hot Noodle Bowl. Bistro V has a swank new bar and specialty cocktails. Where better to celebrate Valentine's Day than in a brand new bar? Jeremy Downey recently expanded Bistro V with a new bar. The bar space doubled the size of this chef driven restaurant with both bar seating and table seating. This stylish bar space has bamboo flooring and ceiling, comfy love seats, leather chairs, soft Edison lighting and tables of rough hewn wood. Dyron’s fried oysters and crab claws make perfect appetizers. The fried crab claws at Dyron’s are an addiction of mine. I attempt to order them even when they are not listed on the menu. And so far I have always succeeded in having them fry up an order as requested. Accommodating such requests is fitting of the low-key attitude that Dyron and Sonya Powell have achieved at Dyron’s Lowcountry. Pair Zin with Steak Au Poivre at Village Tavern. Tender steak, creamy potatoes and a big, red wine make a classic meal. 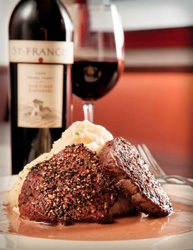 At Village Tavern, this classic is fulfilled in a pairing of Steak Au Poivre and St. Francis Zinfandel, 2009. Savor fresh fare in a swank ambiance at Seasons 52 Fresh Grill. Seasons 52 Fresh Grill recently opened to a packed house at 245 Summit Boulevard at The Summit. The restaurant is open for lunch and dinner seven days a week, boasting live music nightly and a wine bar. The menu is seasonal and weekly, with 52 menus of chef’s dinner specials, thus the name “Seasons 52.” All dishes are planned for calorie count—with nothing on our menu more than 475 calories. I fall in love with Bistro 218 at first bite! Downtown Birmingham now boasts another fab, fine dining restaurant. Bistro Two Eighteen incorporates local and regional food products with the culinary styles of traditional French Bistro and modern American. The restaurant opened in November 2012, at 218 20th Street North. And tonight is my first experience. Discover awesome new pours at The Wine Loft. Mike Dunnavant keeps the wine and his passion for it flowing at The Wine Loft. Every time I stop in, he has new and interesting wines on his glass list. And tonight is no exception. Seated on the leather sofa in the private tasting room, we have a nice view of the red wine cellar. This room can be reserved and is no extra charge. I ate every dessert on Bellini’s menu. Bellini’s has a talented, new pastry chef, Amber Croom. She has a new dessert menu. And today I met her and tasted them ALL during lunch: Affogato, Bananas Foster, Bread Pudding, Gelato Flight, Key Lime Panna Cotta, Malt Chocolate Cake with Adult Milkshake, Red Velvet Cheesecake, and Tiramisu. GianMarco’s celebrates a decade of fine dining excellence. It is difficult to believe that I have been dining at and reviewing GianMarco’s Restaurant for 10 years. Seems like yesterday that I had my first dinner here. Kevin and I shared Marco’s Four Cheese Torta appetizer, and entrees of Tuscan Style Grouper and Spaghetti with meatballs and sausage. Tonight all three of these dishes are still on the menu. Indeed, not a lot has changed at GianMarco’s during the past decade—because the Respintos had it right from the beginning. Still family owned and family operated GianMarco’s remains one of my favorite restaurants anywhere. They serve the highest quality Gulf seafood, delicious meats, and authentic Italian fare with portions that are substantial but prices that are not. Chris Hastings achieves most successful year to date in 2012. This year Hastings presence on the national culinary stage hit a new high with his 2012 Best Chef of the South James Beard Award and his triumph on Iron Chef America. In 2012 Hastings also appeared on The Today Show, CBS Morning, and Martha Stewart and was featured in national food magazines. Highlands Bar and Grill celebrates 30th Anniversary! On November 21, 1982 Frank Stitt opened his first restaurant, Highlands Bar and Grill. And Birmingham’s transformation as a culinary gem began. The restaurant set the benchmark for Birmingham restaurants and began an evolution of the city’s education, appreciation and sophistication of both food and wine—one winemaker dinner at a time. And while Birmingham had some great restaurants before Stitt’s, today we have many more because of him—including his four restaurants and all the chefs who worked with Stitt before opening their own eateries. Vino is an intimate dining spot, which celebrates its first anniversary this month. This dinner restaurant boasts a global wine list and handcrafted cocktails paired with fresh and healthy Mediterranean fare. Local and regional foods shine in Dyron’s cuisine. Dyron’s Lowcountry you can’t miss the chalkboard that is front and center. It boasts the local food purveyors with their products served on the menu. This tribute provides both well-deserved recognition and speaks to the authenticity of Dyron’s lowcountry cuisine. I’m hooked on Ocean’s catch and George Reis’ cooking. I love seafood—crab, oysters, scallops, shrimp, grouper, snapper, lobster and more. I like them wood fire grilled, steamed, baked, pan seared, or Southern fried. And Ocean’s offerings and preparations are as vast as the sea—serving only the best quality seafood from every continent—prepared as desired. So what is not to love? Chez Fonfon’s simple grilled fish is simply delicious. When lunching at Chez Fonfon, I arrive early. Today I open the place at 11:00 a.m. because I know that by 11:30 there is typically not a table left. And by noon the bar will likely also be full. Highlands Bar and Grill celebrates 29 years of excellence. On November 21, 1982 Frank Stitt opened his first restaurant, Highlands Bar and Grill. With monies raised from his cooking classes and from his mother mortgaging her home, Highlands opened to rave reviews. And 29 year later, patrons and media are still raving about this French inspired Southern restaurant. Bellini’s Cheese Ravioli is a plateful of comfort. Day and night, locals love to dine at GianMarco’s Restaurant. My favorite beef tenderloin tacos just got bigger! A longtime favorite dish is the Soft Tenderloin Tacos at Village Tavern. Tender bite sized tips of beef tenderloin overfill three warm flour tortillas—in this dish found on the appetizer menu. The tacos also include shredded lettuce, a luscious lime crema, hot salsa and fresh guacamole. Bowls of the creama and salsa are served on the side for those who want to add more. In addition to the beef tenderloin taco, options of fresh fish and chicken soft tacos are also available. Bottega Cafe is an institution among locals. Frank and Pardis Stitt’s Bottega Cafe is one of my favorites for lunch, cocktails and dinner. And I am in good company. Local “movers and shakers” are among the cafe’s steady clientele. Ocean consistently serves the best of fish, prepared to perfection. For seafood lovers, such as myself, Ocean is the place for dinner. Ocean starts with the best quality fish from every continent and prepares it to your preferences. Highland’s Bar and Grill hosts Thomas Keller dinner and book signing. Celebrity chef Thomas Keller visits Birmingham. He is hosted by Frank and Pardis Stitt for a dinner and book signing—for his latest cookbook, Ad Hoc at Home—at Highlands Bar and Grill. Food is both simple and magical at Hot and Hot Fish Club. Catch a behind the scenes glimpse of the people who make Hot and Hot Fish Club a success. Find the best seat in the house, and most importantly get a bite of the best dishes—course by course. 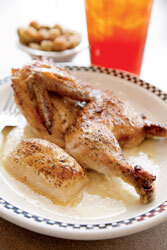 And find recipes from Chris and Idie Hasting’s cookbook—hot off the press. Highlands Bar and Grill is rich in history and deserving of accolades. In 2009 Highlands Bar and Grill was a nominee for James Beard’s top honor, our nation’s most outstanding restaurant. How can I follow such a rave review? I can’t. Yet I can share my own dining experience tonight—and my knowledge and experience of this restaurant and its cuisine developed over many years as well as tonight’s dining experience. GianMarco’s family, food and experience bring diners back for more. GianMarco’s is a cult restaurant. Regulars would like to keep this small Italian, family owned and family run restaurant all to themselves. But—good or bad—foodies tend to dine and tell their dining experiences. Thus they soon find themselves boasting about their lunch or dinner at GianMarco’s to family, friends and co-workers, only to find them at the next table the following week. Ocean’s wide net of offerings touches all continents and satisfies many appetites. To say that Ocean is a “seafood restaurant” is an understatement. This upscale, restaurant’s cuisine draws flavors from every continent. On the menu are fish from the Gulf of Mexico, Atlantic, Pacific and the Mediterranean. And in the kitchen, executive chef and owner, George Reis uses spices and techniques from the countries that surround these waters. Chez Fonfon's Chocolate Pot De Creme is a pure pleasure. I have never had much of a sweet tooth. I can easily say, "No" to most desserts. But at Chez Fonfon the first thing I see each time I enter the door is dessert. Fresh baked tarts, a towering cake and other specialties of the day line the antique, wooden server and the small, white marble-topped table beside it. Bottega celebrates 20th anniversary and debut of the restaurant's cookbook. Bottega Restaurant has much to celebrate. In 2008 the restaurant's interior underwent a remodeling that retained the integrity of its architecture but updated its ambience. This same year, executive chef Frank Stitt was awarded the national distinction of being one of five chefs to receive a James Beard Nominee for Outstanding Chef. And Stitt's new cookbook, Bottega Favorita, which debuted in Birmingham in November, will become available in bookstores nationally on January 1, 2009. GianMarco's cheese ravioli is both large and light. Ordering lunch or dinner at GianMarco is always a dilemma. But no matter what I order, it is consistently delicious and always arrives hot with steam rising from the plate. And this always reminds me of co-owner, Giani Respinto's line, "People wait for pasta. Pasta does not wait for people." Chez Fonfon is classically French and absolutely excellent. Excellence is easy to observe and difficult to replicate. Frank and Pardis Stitt replicate excellence without replicating restaurants. Each of their eateries (Highlands Bar and Grill, Bottega, Bottega Cafe, and Chez Fonfon) has its own identity, style, cuisine, and standard of excellence. With each dining experience comes a renewed respect for the Stitts. Being a bit of a Francophile, Chez Fonfon satisfies my appetite for French bistro fare and French wine. Village Tavern's Birmingham location is home to the company's corporate executive chef. Mary Grace Viado is the corporate executive chef for the eight Village Taverns across the United States. As corporate executive chef for the company, it is Viado's job to create and execute recipes. Hot and Hot Fish Club's tasting menu has it all. Co-Owner and executive chef of Hot and Hot Fish Club, Chris Hastings created a menu just for my table and paired each course with wines. And they will happily to do the same for you. Explore the depths of Ocean's diverse offerings. Ocean celebrates its fifth anniversary. And patrons continue to discover fresh, new pleasures from its extensive menu. Ocean is locally owned and operated by executive chef, George Reis. Highlands Bar & Grill transcends time and exceeds expectations. Convinced that Alabama would support a restaurant with "southern soul and Provencal flavors," Frank Stitt raised money teaching cooking classes, his mother mortgaged her home, and Highlands Bar & Grill opened November 21, 1982. Stitt quickly became Birmingham's celebrity chef and put the city on the culinary map. Family owned and operated, GianMarco's serves the finest authentic Italian fare. Less than three years ago, GianMarco's opened in Homewood and quickly became a neighborhood favorite. Soon afterwards, recommendations of their authentic, Italian cuisine and treat you like family service brought diners from far beyond the neighborhood. And today brothers, Giani and Marco Respinto and their father Giovanni's restaurant is a small, "Italian" landmark for Birmingham area diners.